I know, I know, it's a little arrogant. I call him Solly though. 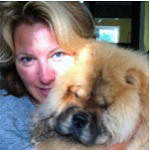 My 2nd chow chow. Gave up my last one, Chakrii, in September and regretted it. But Chakrii was from a sketchy breeder, and he was way too cheap. 600 bucks, and wasn't registered. Was convinced he was mixed, he was way too athletic and active, even though he had a full purple tongue. They told me he was purebred. I did everything right from the beginning (8 weeks), socialized him as much as I could. He was still attacking people besides me, so I had to give him up. I hated doing it. But he was going to seriously hurt someone. It reminded me of when my sister got a dog/wolf mix. I hate when people breed like that. So damn irresponsible. I made the decision to invest in a new Chow Chow from a legit breeder. Paid the normal expensive price for him, and he is registered. Best animal I've ever owned. Solly from day one (6 weeks) follows me everywhere, never pooped in the house once, and has only peed a few times. He's smart as hell, but the best thing is he loves and is gentle with kids and the other dog in the house. He is killing the myth that Chows are mean aggressive lion/bears. They are so misunderstood, and now know why you need to be experienced and researched on them. He sleeps by my feet every night. I only made one mistake with him, and that was leaving my MacBook open and fell asleep. He ate the corner, and now will need to replace it. But I would eat it too if I was a Chow. Other than that, he just loves chewing towels, socks, and sqeaky toys. So moral of the story is that they are some of the best dogs you can own if you do your research and get it from a good breeder. Note: They are mean aggressive bears, if you pick a fight with one. They earned that rep, and they shouldn't be ashamed about it. I used to have a gal who was the Empress of the Known Universe, and nobody in their right mind challenged that. In the thousands of dogs she saw in here life, not one, save her big brother ever thought to challenge it. That said , if she got mad, everyone ran. Now in context she was the most out going, friendly Chow to live, loved people, loved kids, made friends with animals and people everywhere, well except for the animals she was hunting anyway. It is not a bad thing to not be a push over.